Catch Me and Scott Stewart. Photos copyright Sportfot. Wellington, FL – February 20, 2016 – In the 20-year history of the WCHR Peter Wetherill Palm Beach Hunter Spectacular, one well-known name never made it on to the roster of winners until now. Scott Stewart, of Wellington, FL, showed in almost every year of the competition in his long running and decorated career as a top hunter rider, but the winning prize had eluded him. On Saturday night at the 2016 Winter Equestrian Festival (WEF), Stewart finally got his victory with a nine-year-old Holsteiner gelding named Catch Me, owned by David Gochman. The United States Hunter Jumper Association’s (USHJA) World Championship Hunter Rider (WCHR) competition welcomed hunter riders to center stage Saturday evening under the lights of the International Ring at the Palm Beach International Equestrian Center (PBIEC). The country’s best professional, amateur, and junior hunters vied for honors in the $100,000 feature event. Stewart and Catch Me took top honors, while Kelley Farmer and Like I Said finished second, and Chris Payne and Truman placed third. Two jumper classes were also featured on Saturday on the grass derby field at The Stadium at PBIEC. The $10,000 Artisan Farms U25 Welcome, sponsored by EnTrust Capital, was held in the morning with a win for Lucy Deslauriers and Hester. The $35,000 Suncast® 1.50m Championship Jumper Classic was featured in the afternoon with victory for Ignacio Maurin (ARG) and Unico. The 12-week WEF circuit runs through April 3 offering more than $9 million in prize money. Twenty-nine qualified entries jumped the first round course in Saturday night’s Hunter Spectacular with the top 12 returning over a handy test in round two. Scores were tallied from three panels, including judges James Clapperton and Tammy Provost on panel one, Scott Williamson and Rachel Kennedy on panel two, and Karen Healey and Mary Lisa Leffler on panel three. First round scores were combined with handy scores for a two-round total and overall placing. Scott Stewart and Catch Me first approached the course from the 24th position in the order of go and jumped to second place in round one with a score of 91.33. The pair then returned in round two to earn the highest handy score of 93.83. Their two round total of 185.16 earned Stewart a memorable win. Watch Catch Me and Scott Stewart in their classic round! For his victory, Stewart was presented the Dark Continent Perpetual Trophy, donated by Jim Green, as well as the Let’s Dance Perpetual Trophy, donated by Gene Mische. Catch Me was recently named the USHJA WCHR Hunter of the Year for 2015 and also received the WCHR Peter Wetherill Cup on Saturday night. Catch Me, who normally competes in the Second Year Green Working Hunters and was champion of that division earlier in the week, came out like a pro for his classic round and returned with a brilliant handy round, finishing with a bold gallop down to the final oxer that sealed the deal. Kelley Farmer, of Keswick, VA, guided her mount Like I Said to a second place finish with an overall score of 181.46. The eight-year-old Mecklenburg mare (whose sire is fifth place finisher Carrico) scored an 89.30 in round one and earned the second highest handy score of 92.16 to move up in the standings. The mare was owned by Glefke & Farrington LLC up until this week, but was purchased by Maura Thatcher’s Pony Lane Farm. To qualify for the night’s class, Like I Said won the Equine Tack & Nutritionals First Year Green Working Hunter championship this week. Top grand prix show jumper Kent Farrington purchased Like I Said and imported her from Europe. She did some jumpers, but at the end of the second week of WEF competition, Farrington called Farmer and said that he had a hunter. Chris Payne, of Cincinnati, OH, was aboard Debbie Bass and Maypine Farm’s Truman for his third place finish and also accepted the Charlie Weaver Perpetual Award for the highest scoring horse in the first round with a mark of 92.16. The pair then earned an 88.50 for their handy round to total the third place score of 180.66. Truman, a nine-year-old Westphalian gelding, was champion of the Shapley’s Grooming Products Regular Conformation Hunters to earn his qualification for Saturday night. Payne imported Truman as an inexperienced five-year-old from Europe and was pleased with his mount’s performance in his first night class. The horse had a light schedule last year as Payne went through chemotherapy for non-Hodgkin’s lymphoma. The rider has been back in the saddle for about four months now after completing his treatment. To come back so strong after a difficult year was exciting for Payne and he thanked Truman’s owner and praised his mount. Brady Mitchell earned both the fourth and fifth place prizes with two talented mounts. Mitchell rode Cassanto to the fourth place finish for owner Emily Perez with scores of 89.66 and 88.16 for a 177.82 total. His mount Carrico, owned by Callie Seaman, placed fifth with scores of 88 and 89.66, totaling 177.66. Farmer jumped her second mount, It’s Me, owned by Farmer, Phinney and Hill, to sixth place with a score of 177.49 (88.16, 89.33). Stewart and Dr. Betsee Parker’s Lucador finished seventh with a score of 175 (87, 88). In the Bainbridge Companies Amateur-Owner 18-35 3’6″ Hunters, Stephanie Danhakl and her own Golden Rule, a 12-year-old Oldenburg gelding, took the championship after they placed first and second over fences and were third under saddle. The reserve champion was Chablis, ridden by Kelly Tropin for Libertas Farm LLC. They were second in the under saddle and won an over fences class. This is the pair’s second year competing at WCHR week at WEF and their second championship. It also marks their second time competing in the night class, which they placed ninth in last year. “It’s an honor to be in the company of Scott Stewart and Kelley Farmer and all the other great riders that are in that class,” she said. Danhakl is currently a research assistant at the Museum of Fine Arts in Boston, in the American Art Department and is waiting to hear about Ph.D. programs. John Ingram qualified for his second consecutive appearance in the WCHR Peter Wetherill Palm Beach Hunter Spectacular with 13-year-old Holsteiner gelding Airport 48 by jumping to champion in the Hunt, Ltd. Amateur-Owner Over 35 division. Airport 48, owned by John and Stephanie Ingram, LLC, won the handy and stake over fences rounds. Saturday night marks Ingram’s fourth time competing in the Hunter Spectacular, and he is proud to do it with Airport 48. Reserve champion honors in the Amateur-Owner Over 35 division were presented to Jessica Cherry and Blue Note after they took first over fences and fourth in the handy. Fifteen-year-old Emma Kurtz of Hudson, OH continued her dominance in the junior hunters this week with two horses that are a bit more familiar to her than her usual catch rides. Both Prologue and Wisdom spent the summer with her, where she got to ride them every day and get to know them. Kurtz trains with Amanda Lyerly. Kurtz and Prologue, an 11-year-old Warmblood gelding by Padinus owned by Rendezvous Farm, were champions in the CWD Saddlery Large Junior 15 & Under Hunters. They won all three over fences classes and were sixth in the under saddle. Prologue is trained by Cookie Beck with Chrystal Knight. While Prologue and Kurtz spent last summer together, WCHR week is their first time competing together this winter. “He loved it in (the International ring). He’s perfect in situations like that. He’s really fun,” she described. The reserve championship in the Large Junior 15 & Under Hunters went to Cuba, owned by Missy Clark & North Run and ridden by McKayla Langmeier. They placed second, third, and fifth over fences and were fourth in the under saddle. Kurtz also garnered the Equestrian Sotheby’s Small Junior Hunter 15 & Under championship riding Rivers Edge’s Wisdom, an eight-year-old Holsteiner gelding by Casall. They placed first, second, and fifth over fences and won the under saddle. Daisy Farish rode Casares for James Lala and Virginia Confer to the reserve championship after they were first, second, and second over fences and sixth in the under saddle. 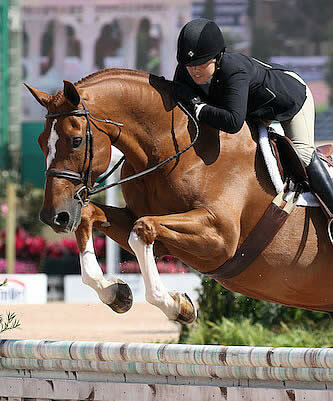 Kurtz competed with both horses in the WCHR Peter Wetherill Palm Beach Hunter Spectacular, the first time for both horses in the class and her second time. Giavanna Rinaldi dominated the EnTrust Capital Small Junior Hunter 16-17 Division this week, jumping Natalie Jayne’s Outlook to Champion and Bugsy Malone to Reserve Champion for owner Alex Jayne. Rinaldi, 16, was first over fences, won the stake, and scored second in the handy to secure high-point honors with Outlook. Rinaldi says Saturday’s stake class was the highlight of her week. Saving her best trip for last, she pocketed a 90 in the stake aboard Outlook. Collecting two second-place ribbons – one over fences and one in the stake – in the irons of Bugsy Malone, Rinaldi swept the division titles. But according to her, they were anyone’s for the taking. Rounding out the Bruno Delgrange Large Junior Hunter 16-17 Division, Lilli Hymowitz and Garfield, owned by Rose Hill Farm, topped all contenders over fences and collected third in the handy for the championship. Garfield, a 14-year-old Holsteiner gelding, has been the ride of Hymowitz since last year after her sister Cloe campaigned him in the hunter divisions during the 2013 and 2014 seasons. Splitting her time between hunter and jumper competition, Hymowitz has spent time in the International Arena on her jumper horses, but always looks forward to competing her hunters in the bigger ring. “I think the division was super competitive this weekend and being able to show off in the big ring was super special,” she said. Teddy Vlock and his own Grey Street were named reserve champions after winning the handy and taking fifth in the stake, as well as under saddle. Richard Jeffery (GBR) set the courses on the derby field at The Stadium on Saturday. For the $35,000 Suncast® 1.50m Championship Jumper Classic, Jeffery saw 34 starters with five clear rounds to advance to the jump-off. Emanuel Andrade (VEN) was first to jump-off with his horse U and dropped one rail in 45.22 seconds to eventually finish fourth. Laura Kraut (USA) was next to go with Cherry Knoll Farm, Inc.’s Constable, clocking the first clear round in 46.08 seconds for second place honors. Chris Surbey (CAN) and Linda Southern Heathcott’s Quetchup de la Roque returned next with four faults in 45.19 seconds to place third. Josephina Nor Lantzman also finished with four faults in 48.91 seconds to take fifth place honors aboard Unlimited. Last to go, Ignacio Maurin had nothing to lose with Stransky’s Mission Farms’ Unico. The Argentine rider cleared the course in the winning time of 45.51 seconds aboard the 15-year-old Dutch Warmblood gelding (Odermus R x Wuzo). Maurin first moved to the United States two years ago, working for a family in Seattle before coming to Wellington to work for Lillian Stransky eight months ago. Maurin got the ride on Unico in November and has been getting to know his mount throughout the start of WEF. Maurin also learned that Unico likes jumping on the grass better than sand, and used that to his advantage on Saturday. He also had the advantage of his position in the jump-off order. Maurin’s next goal is to compete well for Argentina in week eight’s $150,000 Nations’ Cup CSIO 4*. Competition on the derby field at The Stadium at The Palm Beach International Equestrian Center (PBIEC) kicked off on Saturday morning with the $10,000 Artisan Farms U25 Welcome, sponsored by EnTrust Capital, during week six of the 2016 Winter Equestrian Festival (WEF). The speed track set by Richard Jeffery (GBR) saw 71 starters with a win for 16-year-old Lucy Deslauriers and Hester. The pair completed the fastest of 17 clear rounds in 60.73 seconds. Madison Goetzmann and her own Wrigley took second place honors in a time of 62.37 seconds. Allison Toffolon and Toffolon Partners’ Gatsby finished third in 62.68 seconds. Emily Moffitt and Poden Farms’ For Sale 6 clocked in fourth in 62.86 seconds. Emma Heise and Old Willow Farms’ Viper Vrombautshoeve Z placed fifth in 63.91 seconds, and Eve Jobs and her own Sandor de la Pomme rounded out the top six with a clear round in 63.98 seconds. Owned by Lucy Deslauriers’ mother, Lisa Deslauriers, Hester is an 11-year-old Belgian Warmblood gelding by Wandor van de Mispelaere x Palestro. The pair has been partnered since 2014 and has earned many top accolades together. Deslauriers drew an early spot, seventh to go in the order for the morning, and knew she had to set a big challenge with so many riders to come. Deslauriers has a great relationship with Hester, but there are always things to work on in every partnership, and Saturday’s class on the field gave her a chance to get some different experience with her mount. Presented by The Dutta Corp. in association with Guido Klatte, the Artisan Farms Under 25 Grand Prix Series will feature three more events showcasing top young talent in show jumping sport this winter. For the final event of the Series, the top 30 riders in the point standings will be invited to contest the $50,000 CSI-U25 Artisan Farms Under 25 Grand Prix Final held on the derby field at The Stadium at PBIEC on Saturday, March 26. The $25,000 Artisan Farms U25 Grand Prix, sponsored by EnTrust Capital, as well as the $50,000 WEF 6 National Grand Prix, will both be held on the derby field at The Stadium on Sunday. Hunter competition concludes in the International Ring for the week featuring the $5,000 Peggy Cone Memorial Adult Hunter Classic, the $5,000 WCHR Amateur-Owner 3’3″ Hunter Classic, and the $5,000 WCHR Junior 3’3″ Hunter Classic. For more information and full results, please visit www.pbiec.com.